Vagaries' Sunday Weekly Forecast for the week 4th March to 11th March. 1. M-1 moves across northern regions of sub-continent. Moves thru Kashmir and H.P. on Sunday and Monday.Spreads to Nepal on Tuesday, but restricted to Western regions.Kathmandu cloudy during this period. Rise in night temperatures. M-1 moves away by Tuesday. 2. A high presuure in the Arabian Sea combined with the moving away of the W.D, NW winds continue to dominate the North-West regions and Central India. High pressure fades away after Wednesday. Till then, will bring strong W winds to Sindh coast and Kutch and Saurashtra regions. 3. NW winds will blow into the Konkan and Interior Mah and prominenetly in Gujarat on Tuesday and Wednesday. 4. Real rise in day temperayures will take place in Vidarbh, N.Interior Andhra and interior Karnataka from Friday. Days remain in the near normal range in India in the first of the week.Nights could be below normal in NW, Central and Western India. 5. For Pakistan Sindh region will be dry, and heating gradually from Wednesday onwards. 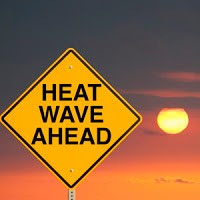 Hot spots likely to reach 38c by week end. is there any one to one correlation of late summer start and delayed monsoon ? what according to you is delayed summer start ? i assume that so far no one to one correlation has been established to summer severity and performance of monsoon. Ananth: right from the commencement of March, the day temperatures normally start rising in South and move towards A.P./int Mah and parts of central India as the month progresses. Any delay in this, or the temps remaining below normal, I would consider as a late start to summer. A late start to summer would mean a coolish March. A cool march, would generally and normally lead to a hot April and would culminate in heat waves in late April and early May. This would mean a good begining to the SWM. A hot March, would move on to a "rainy" and wet April, cooling the days. This would delay and postpone the heat waves in Raj.Vid to mid May or even late May. That would transalte to a weak SWM start, or even a delayed start. These are my pesonal observatons over many years and jottings from my records and diaries.Feel free to ask or question me on this. sridhar: i dont understand ? a trough now runs from NE India to the Arabian Sea. Do u mean that ? jignesh: Thanks for the report. Vagaries' windy weekend estimate was right. no, i was wondering if there was an WD forming around the 8th...? sridhar:If another WD was forming, i would have surely mentioned in the weekly report. M-2, the Next WD is likely around 15th March. No effect south of Punjab of that system. Thanks for the answer, i hope mild summer does not affect monsoon performance chances. Already Telegana, Maharastra and karnataka are in grip of drought. A bad monsoon will break their back. Karanataka is grip of advance summer- Bangalore already 38degrees!! This is bound to touch 40degrees!! Infact no difference between Bangalore and Rayalseema, Bellary -45degrees. With no trees, continous mining, horrible infrastructure, maddening traffic,corrupt government Bangalore/Karnataka has turned from bad to worse.No water, no power in Bangalore/Karnataka/AP. Next few years these areas will become deserts-already desertification has started. Maharastra/Gujarat is much better. I don't agree with Ananth statement-Maharashtra 2011 has excess monsoon, all lakes overflowed, rain exceeded Cherrapunji. Maharastra/Gujarat is much better. I don't agree with Ananth statement-Maharashtra 2011 had excess monsoon, all lakes overflowed, rain exceeded Cherrapunji. sset: Highest in Bangalore as yet is 35.4c this year, and have mentioned it in vagaries few days back. sridhar: now, another WD is expected..contrary to my earlier estimate. Your assumption was correct. Though there were no signs or indications then.